A 12-year-old boy was referred for evaluation of cardiac mass. He had progressive exertional fatigue for 1 year and palpitations for the past 6 months. There was no history of prolonged fever, joint pains, weight loss, or chest trauma. There was no known heart disease in the past. On examination, heart rate of 100/min, blood pressure of 110/70 mmHg, and raised jugular venous pressure of 7 cm above the sternal angle were found. The cardiac examination was apparently normal. Other systems examination was also normal, except a 5 cm hepatomegaly. 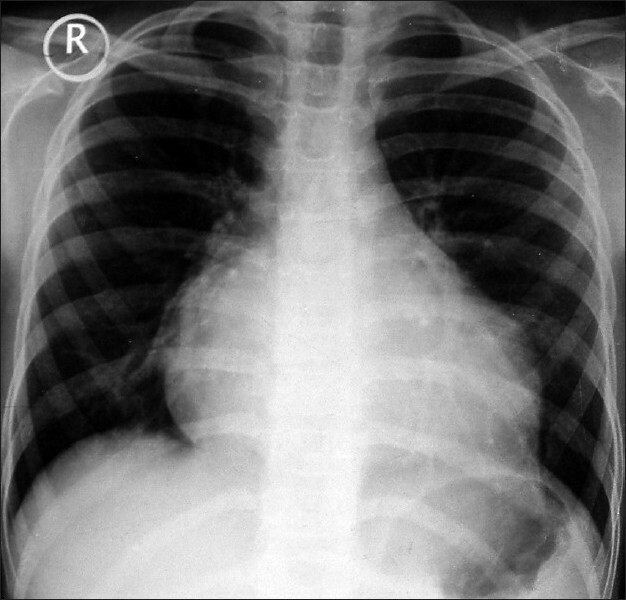 The chest X-ray showed mild cardiomegaly and clear lung fields [Figure 1]. Routine hematological and biochemical investigations were unrevealing. 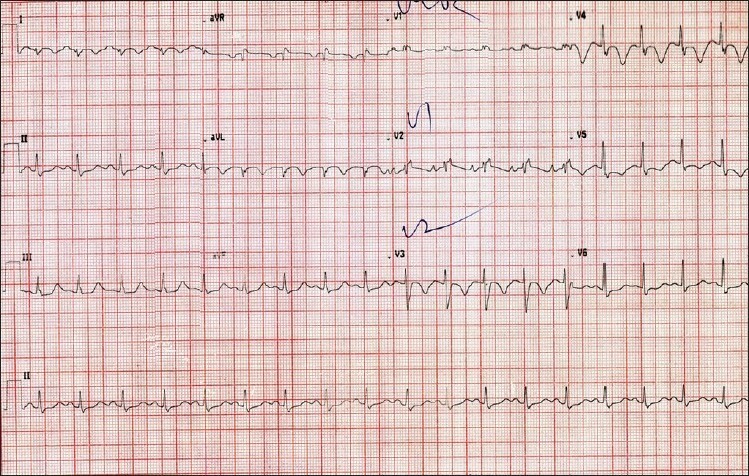 The electrocardiogram (ECG) showed incomplete right bundle branch block and prominent, diffuse ST-T changes, including saddle-shaped elevation in V1 [Figure 2]. An echocardiogram showed an infiltrating mass lesion involving both the right and the left ventricles. The mass appeared more prominent around the right ventricular outflow tract. The contractility was mildly reduced in both the ventricles. The diagnosis was not clear. A cardiac magnetic resonance (CMR) imaging (1.5 T, Magnetom Avanto, Siemens, Germany) was performed. 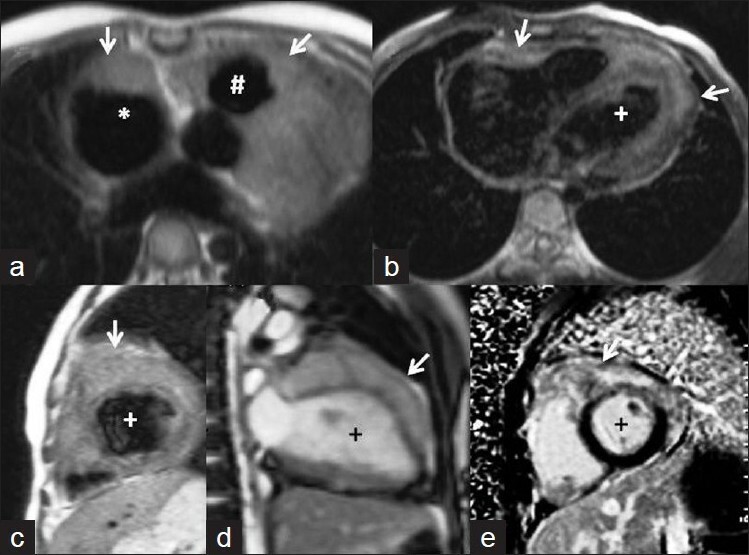 Spin- echo T1-weighted axial images [[Figure 3]a and b] showed isointense, multiple, discrete or contiguous, nodular infiltrative masses along the anterior wall of the right atrium (which was dilated), right ventricular outflow tract, and along both the right and the left ventricles. The lesions appeared to predominantly involve the outer myocardium, with the pericardium being indistinct in several places. There was no mediastinal lymphadenopathy and no pleural or pericardial effusions. On the spin- echo T2-weighted images [[Figure 3]c], the lesions were isointense to mildly hyperintense. The steady state free precession (SSFP) sequence [[Figure 3]d] showed the lesions to be homogenously hyperintense with reduced systolic ventricular function. On the delayed enhanced sequence [[Figure 3]e], the lesions enhanced with small areas of heterogeneity. There was no thrombus. A non-contrast computed tomography of the chest was also performed and was normal. Differential diagnosis included metastasis, sarcoma, and lymphoma. In view of the clinical history, absence of imaging characteristics typical of these lesions, and our own experience with imaging of cardiac tuberculosis, the latter was strongly considered and antitubercular therapy was initiated. Tissue diagnosis was not performed. Six months after the antitubercular treatment, the patient had clinical signs of mild constrictive pericarditis. A repeat CMR showed significant reduction in size of all the lesions, with only mild residual thickening at the previous sites of involvement [Figure 4]. Cardiac tuberculosis usually involves the pericardium. Myocardial involvement is rare, and is described in up to 0.3% of the patients dying from tuberculosis. Myocardial tuberculosis can present with rhythm disturbances, congestive heart failure, ventricular aneurysms, right ventricular outflow obstruction, coronary involvement, caval obstruction, and aortic insufficiency. ,, The modes of spread to the myocardium include through lymphatics from mediastinal nodes, directly from the pericardium, or via a hematogenous route. While mass-like lesions are reported,  a diffuse infiltrative lesion is extremely rare. 1. Horn H, Saphir O. The involvement of the myocardium in tuberculosis: A review of the literature and report of three cases. Am Rev Tuberc 1935;32:492-506. 2. Wallis PJ, Branfoot AC, Emerson PA: Sudden death due to myocardial tuberculosis. Thorax 1984;39:155. 3. Aggarwal R, Malhotra P, Awasthi A, Kakkar N, Gupta D. Tuberculous dilated cardiomyopathy: an under-recognized entity? BMC Infect Dis 2005;5:29. 4. 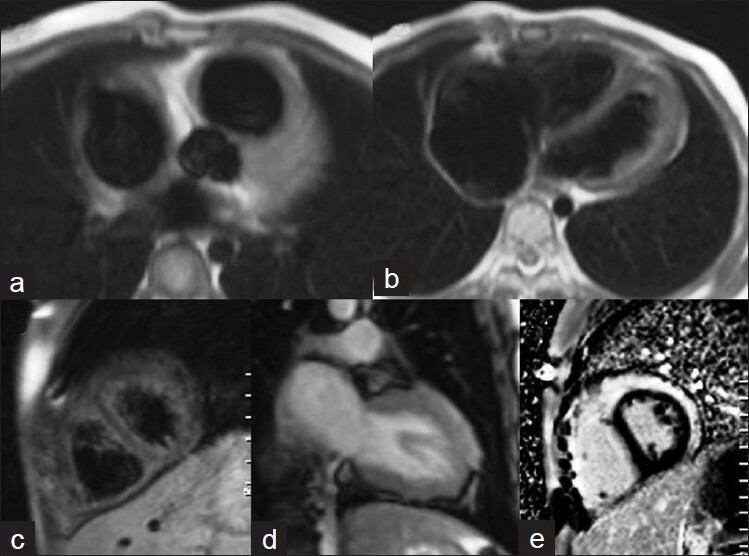 Jagia P, Gulati GS, Sharma S, Goel NK, Gaikwad S, Saxena A. MRI features of tuberculoma of the right atrial myocardium. Pediatr Radiol 2004;34:904-7. 5. Gulati GS, Sharma S, Kothari SS, Juneja R, Saxena A, Talwar KK. Comparison of ECHO and MRI in the imaging evaluation of intracardiac masses. Cardiovasc Intervent Radiol 2004;27:459-69. 6. O'Neill PG, Rokey R, Greenberg S, Pacifico A. Resolution of ventricular tachycardia and endocardial tuberculoma foll-owing antituberculosis therapy. Chest 1991;10:1467-69.